When you call certain plants deer-resistant perennials, it does not mean that Bambi never eats them. Rather, the term is meant to call attention to plants that deer finds less attractive than the other choices on its menu. But do be aware that deer will eat just about anything when starving, lest you be lulled into a false sense of security. This tactic in deer control simply allows you to play the odds through smart plant selection. If you grow plants that deer are less likely to eat, you increase your chances of escaping pest damage. All of the perennials on this list are hardy to at least USDA planting zone 5 unless otherwise noted. The most widely grown bleeding heart is Dicentra spectabilis. This deer-resistant perennial can become quite large under the right growing conditions. When that happens, it is a spectacular plant as the species name suggests. But even as a smaller plant, it can be a real looker, as your attention is drawn to the uniquely-shaped individual flowers. It is hard to think of a cuter and more aptly named plant. The shape of a bleeding heart's flower lives up to the plant's common name, right down to the little droplet dripping out from the bottom. Fringed bleeding heart is a smaller plant than its showier cousin. As lovely as Dicentra spectabilis is, some prefer fringed bleeding hearts (​Dicentra eximia). The fern-like foliage is more attractive and its leaves last through the summer heat unlike common bleeding hearts. Yet another plant in the Dicentra genus is Dutchman's breeches (D. cucullaria). 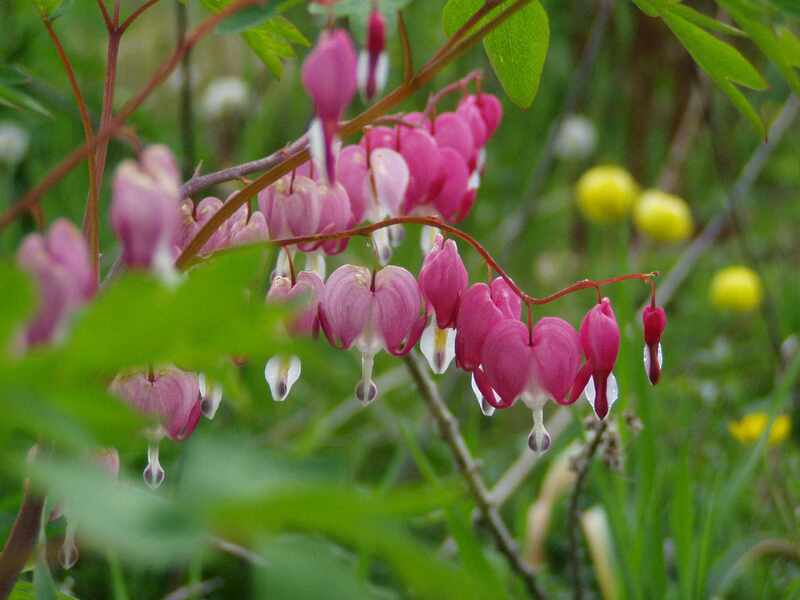 The shape of its flower matches its common name as perfectly as does bleeding hearts for D. spectabilis and D. eximia. But, in one respect, Dutchman's breeches could not be any more different from fringed bleeding hearts, the leaves do not hang around for very long at all. Shortly after it is done flowering, the whole plant (above-ground) disappears. You will not see it again until the next spring. Catnip plants are catmint plants, but not vice versa. Any plant listed as being in the Nepeta genus is considered to be a catmint. Catnip's botanical name is Nepeta cataria, which means it is a type of catmint. But there are other deer-resistant perennials in the Nepeta genus that are grown for their ornamental value. They are long-blooming perennial plants. Nepeta racemosa Little Titch is an example of one. Deer hates the smell of these plants, which causes them to avoid eating them. You may know yellow alyssum (Aurinia saxatilis) better by such common names as "Basket of Gold," a reference to both the abundance of its flowers and their striking color. This yellow alyssum, when planted in masses and displayed to best advantage, will give your landscaping jaw-dropping beauty in spring. Aurinia saxatilis is a short, mat-forming plant, making it an effective ground cover. Its blue-grey leaves only add to its value. Like daffodil bulbs (Narcissus), there is a good reason why deer leaves foxglove alone: It's poisonous. Digitalis plants are tall, slender perennials at 2 to 5 feet tall and just 1 to 2 feet wide. Their height makes them good choices for the back row of a layered flower bed. Meanwhile, as plants that tolerate dry shade, they are useful for filling up spots in your landscaping where many other plants would be unhappy. Another plant that deer will leave alone and that tolerates partial shade is wood spurge (Euphorbia amygdaloides). Like the related garden sage plants (Salvia officinalis), ornamental salvias are not eaten by deer for the same reason that deer do not eat catmints: They stink. Grow Salvia officinalis Tricolor if what you desire is a splendid foliage plant. Its variegated leaves boast three colors: white, green, and purple. But if it is flowers you want, grow any of the blue-flowering salvias. Caradonna salvia is a favorite, as gardeners adore its dark, graceful flower spikes. If you want something spiky but you do not like salvia, grow red hot poker plants (Kniphofia): These are not favored by deer. Unlike salvia, their spikes come in flashy, warm colors. Deer find a number of herb plants stinky, especially those in the mint family, such as bee balm (Monarda didyma). It is not just poisonous plants and plants with strong, sharp odors that deer mostly avoid. For some reason, ornamental grasses are not a favorite food, either. And, in addition to plants with unpleasant odors, deer do not eat plants that smell perfumy. That works out well for people who love to grow perennials with sweet-smelling flowers such plants in the Iris genus. Not all irises are equally fragrant. When in doubt, try to find the old-fashioned, bearded varieties. Lamb's ear (Stachys byzantina) is another case of a deer-resistant perennial that is hard to figure. It is easy to see why deer would not want to eat prickly plants; it is not so easy to figure out why deer are turned off by the velvety leaves of lamb's ear. Maybe they are too dry (like eating wool)? Lamb's ear spreads easily, making it an effective ground cover. A drought-tolerant perennial, it also works well in rock gardens. Its soft, silver leaves give a nice backdrop to companion plants. Lavender is the poster child for perennial herbs or subshrubs that are grown for their smell. Ants, too, dislike the smell of lavender, which has made this deer-resistant perennial useful, traditionally, and for organic ant control. Teucrium chamaedrys is another perennial herb or subshrub that deer tend not to eat. This perennial for zones 5 to 9 does wonders in the knot gardens of traditional formal landscapes since you can grow it in rows to form "living edging." Meanwhile, the related T. fruticans, which is also deer-resistant, is great for sculpting topiary creations, although it does have the drawback of being hardy only in zones 8 to 10. Helleborus orientalis is one of those spring flowers that bloom early in the season. For this reason, it is much-valued by those who must endure long bouts of cabin fever every winter. Technically, the showy feature of this deer-resistant perennial is called a "sepal," as opposed to a true flower petal. Call this feature what you like, but what is impressive is how long the plant retains it, giving you something interesting to look at in the garden for months. Lenten rose is, in fact, a fascinating plant all the way around, from the look of its leaves to the origin of its name. If, instead, you are looking for a late-blooming perennial that deer do not eat, try Montauk daisy (Nipponanthemum nipponicum). The splendid peony has large, beautiful, fragrant flowers. It does not need to be fussed over (for example, it does not need to be divided, and these flowers live a long life (your peonies may outlive you). If you have never given them a try before, you now have an excuse to do so if you are seeking deer-resistant perennials. Large, brightly-colored flowers with the texture of crepe paper have long made oriental poppies (Papaver orientale) a favorite in the garden, especially for those seeking cut flowers. Like some of the other deer-resistant perennials, this classic cottage garden plant is toxic. This is a specimen you will want to locate somewhere where you can fully appreciate the beauty of its flowers during the blooming period (May or June, depending on where you live). Oriental poppies put on a spectacular, although brief, floral show. Dry the pods left over after the blooming period for craft projects. Just because a plant is listed as a deer-resistant perennial, does not necessarily mean that you should grow it. Research all plants carefully before deciding to grow them. You may find that their bad qualities outweigh their good qualities, in some cases. Such can certainly be the case with tansy (Tanacetum vulgare). It is a deer-resistant perennial, however, it is an invasive plant and a poisonous plant. This long-bloomer, also known as "speedwell," begins flowering in late spring to early summer and continues for the rest of the growing season with a little help from you. You can make its display of blue flowers last longer by shearing. There are many kinds of speedwells. Some grow a cultivar called Veronica spicata Royal Candles. From a distance, the plant looks a bit like a small blue salvia. Brunnera macrophylla Jack Frost is one of those plants that you grow primarily for its foliage (so-called foliage plants). Such plants are like true friends: You can count on them to be there for you after many a fickle flower has deserted you. Not that Jack Frost is flowerless. It bears small blue flowers in spring. But Jack Frost's really cool feature is its silver leaves. Those leaves are made even more interesting by being variegated. Columbine plants display colorful flowers against a backdrop of attractive, clover-like foliage. They come in yellow, white, red, blue, pink, or purple. Some are even bi-colored. Columbine is truly one of the stars of the spring garden. If you like the foliage of columbine, then you would probably also enjoy a plant called Columbine meadow rue (Thalictrum aquilegifolium). It is called that because of its columbine-like leaves, which make it attractive long after its flowers have disappeared. The plant can produce white, purple, or mauve flowers. This is a tall plant, reaching about 3 feet in height. Columbine meadow rue is a great choice for woodland gardens since it likes a little shade. But if your meadow is in full sun, a better deer-buster would be coneflower (Echinacea). Here is another pattern you may have observed: Deer often seem to leave plants with silvery foliage alone. Rose campion (Lychnis coronaria) is yet another example. Rose campion is also another example of an invasive plant, so do not make a snap decision about growing it. It is a plant with nice foliage and the kind of floral color that sends some people swooning. But many gardeners find that they have to go around the yard and pull it up from places it does not belong. Delphinium is another old-time favorite for cottage gardens. Plant it next to a south-facing fence, with companion plants sprawling at its feet, and let its graceful flower stalks shoot skywards. You will adore it, but it not high on a deer menu list. These perennials are valued for their true-blue flowers. For some types, the sky-blue color is as stunning as it is on the blue morning glory vines (Ipomoea tricolor). One of those interesting terms you come across in the world of gardening is used to describe the center of a delphinium's flower: the bee. It has nothing to do with the insect. These bees are sometimes white or black; other times, they are not really that distinct, though. Delphiniums hold to the expression, "Live fast, die young, and leave a good-looking corpse." Well, maybe the third part of that saying does not quite apply. But they do shoot up to stand head and shoulders above most other flowers and are very short-lived for a perennial. Rodgersia pinnata is one of those deer-resistant perennials that you can categorize in a number of ways. Some gardeners think of it mainly as an outdoor foliage plant (even though it does produce a plume of flowers), but it is also a shade plant and a good plant to grow in wet areas. Jack-in-the-pulpit (Arisaema triphyllum) is not grown for its flowers. The "pulpit" is a hood-like structure that sits atop this perennial. "Jack" is the little spike that stands up within this hood and contains the insignificant flowers (which you do not really see). If you like plants that are cute and funky, this North American native could be a good one for you to grow. You have an extra reason to grow it if your yard suffers from deer attacks. Deer are not the only cute-but-troublesome pests lurking out there. If your area is plagued by rabbits, avoid growing plants that rabbits eat; opt instead for rabbit-proof flowers. Do You Know Which Perennials to Prune in the Spring? What are 10 Foolproof Perennial Plants for the Northeast?